Active investment management may help address many of the financial concerns of ultra-high-net-worth clients, including their desire to leave a legacy to heirs and charitable causes. While ultra-high-net-worth (UHNW) clients may not have to worry about living paycheck to paycheck or saving for their kids’ college educations, the very rich do have concerns for which an active portfolio-management strategy might prove beneficial. UHNW clients who have more than $5 million in assets want to ensure they will leave enough money to their beneficiaries and, in many cases, to their favorite charities. As such, engaging the services of an advisor practicing active portfolio management may make a great deal of sense. A properly allocated, active management approach can achieve the goal of capital appreciation over time while employing defensive mechanisms in turbulent markets. The resultant smoothing-out of returns is well-suited to maintaining and growing assets for family generations to come. While many UHNW clients may ostensibly be in a position to be more aggressive in their investment styles due to their overall wealth, active portfolio management can accommodate all types of risk profiles, from the most conservative to the most aggressive. Advisors who have the ability to manage portfolio strategies across the risk spectrum will be able to better serve clients with differing investment attitudes and objectives. Conservative, “hands-off” investors who mainly want to take care of their families and are not very interested in the mechanics of investments. Believe investing is a necessary means to an end to gain personal financial freedom. May have inherited their assets but are confused and frustrated by the responsibility of wealth and generally avoid focusing on investing. Value privacy, concentrate their assets, and have a few close relationships with professional services firms. Care most about controlling the asset management process and can present a challenge to advisors. Value prestige and prefer to affiliate with advisors with leading public reputations. Knowledgeable and involved clients whose only goal for investing is to grow their assets. High risk tolerance, relish the process of investing, and feel they have the ability to discern the “next great” investment trend or stock. Technically savvy and very interested in companies with leading-edge products and services. Within these profiles, a wide disparity exists with regard to interest and involvement with investments, their risk profiles, and their attitudes surrounding various types of investment asset classes. Advisors may need to adjust their communication styles for these nine personality types, as well as have access to a wide array of broad investment approaches and specific investment strategies. “One size fits all” certainly does not hold true for the ultra-high-net-worth client. Advisors who employ third-party asset managers, particularly active managers, may have a competitive edge with their diverse array of strategies, the highly sophisticated nature of those strategies, and the ability to formulate portfolio approaches that can work for a wide variety of client risk profiles and behavioral tendencies. UHNW clients, no matter their individual investment outlook, also typically want to continue to allocate a significant portion of their money to charities. According to the 2012 Bank of America Study of High-Net-Worth Philanthropy, 95% of high-net-worth households donate regularly to at least one charity—compared to roughly 65% of the general population. The share of total charitable contributions made by the upper 5% of U.S. wealth holders is staggering. And then there are the affluent clients who still worry whether or not they will outlive their money in retirement. According to a Lincoln Financial survey, nearly half (48%) of wealthy baby boomers who have saved more than $1 million for retirement feared their money would not last until their death. Many of the superrich also worry about the prospect of losing significant portions of their wealth. According to Prince & Associates, more than 80% of those worth $20 million or more are deeply concerned about being the target of lawsuits from plaintiff lawyers who seek out deep pockets. Others cite “medical crises,” “family disputes,” and “changes in the family dynamic” as top worry points potentially affecting their wealth. Advisors can help foster relationships with the children of UHNW clients by engendering trust that their wealth is being proactively managed and protected. 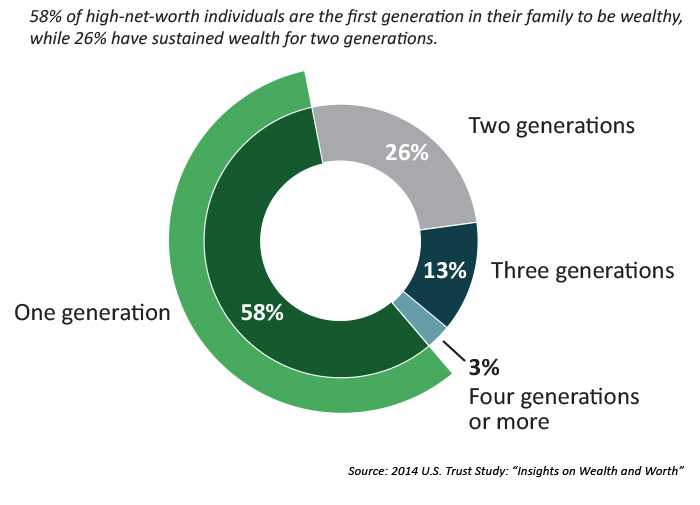 Such strategies would also be effective for those heirs who might have very different attitudes about money than their parents, particularly children of parents who were not born into wealth but accumulated it through hard work and perseverance (see Figure: more than 50% of UHNW are first generation). Through education on the long-term market cycles of economies and investments, where active management can shine, many heirs may learn that they cannot assume their money will always be there for them without proper and continual management. They would benefit greatly from a financial advisor or wealth manager who employs active investment strategies that can be adjusted as market or economic conditions fluctuate. On the flip side, proactive advisors may be able to attract young high-net-worth clients who seek an alternative to their parents’ advisors by demonstrating the superiority of active portfolio management over what may have been a multigenerational static relationship with another advisory firm. Roughly half of rich heirs under the age of 40 say that they are willing to shop for another advisor, according to a recent survey by Morgan Stanley and Campden Research. Advisors may attract young HNW clients by demonstrating the benefits of active portfolio management.